My name is Ayden Jacob and I am a graduate student at Oxford University studying the the effects of radiation therapy in neuro- oncology. After having completed medical internships across the United States and Israel, I was privileged to spend quality time among the people of Kenya. I was given the opportunity to be involved with patients in a hands-on manner, which was very educational, and I surely did learn an authentic amount of medical knowledge from my time there. There is absolutely nothing as great as volunteering in Kenya. I was touched by the warm hearts and kindness of the Kenyan people, and I was given a chance to give back to the world in a meaningful way. Advance Africa gave me the chance to volunteer in an orphanage, teach science courses in an underdeveloped school, and work in a busy hospital. The friends I made on this trip will surely last me a life time, and the experience has truly changed my life for the better. Any medical or premedical student looking to make a difference in the world, help out a needy neighbor, and make some great memories with awesome people on the way, should definitely join Advance Africa. It is a memory that will forever remain engraved in your heart. In addition to this I must include that Joe Ngugi helped tremendously at making this experience successful, manageable, and educational. Joe provided us with good meals, housing, transportation, and medical opportunities. The living conditions were suitable for any US or European student, and the ability to have a real effect on the people of Kenya is unimaginable. 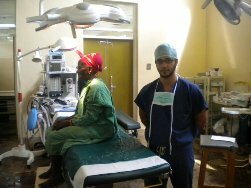 Advance Africa provided me with medical exposure that can be matched by no other internship or medical elective in the world, and I highly recommend any student interested in medicine to join this program. I was honored to lead a team of medical students in the labor and delivery unit of the hospital, where we were solely responsible to deliver several babies over the course of the month, which is a priceless opportunity for learning, growth, maturity, and medical experience. In addition to this, Advance Africa arranged for me to do hands-on rotations in a very busy pediatric burns unit at the Tigoni District Hospital in Nairobi, Kenya. Furthermore, I had the valuable opportunity of opening an HIV and Malaria Clinic at Kenya's busiest hospital; no other international medical program arranged for such hands-on experiences. In our clinic, I managed over 500 patients in a month, sampled their blood, and used microscopic techniques to detect malaria or HIV. Discovering if the challenging and demanding field of medicine is right for you is very serious in nature. Through volunteering in Kenya, in the most underprivileged hospitals you may ever be exposed to, will definitely give you the maturity, integrity, motivation and passion you need to become a successful medical student and future physician. I highly recommend the advance africa program to all premedical students from around the world. It was an experience that will mold you for the rest of your life, and will touch the heart of your hearts beyond you imagination. I was extremely thankful for all the information Joe provided to me before I arrived, I emailed most weeks with hundreds of little questions and always received a decent response promptly! It reassured me knowing that I could always send an email when I had any worries! Joe was there when I arrived and waited for me despite me spending hours trying to find my bag! There was a clear sign with my name so he was easy to identify! I loved working at Destined Orphanage and all the kids and Esther were lovely! It was nice just to spend time with the children talking and playing with them. Really enjoyed it all! All the workers at the orphanage (Esther and Esther) were really welcoming! I enjoyed the visit to Kibera and giving the children presents (toys, sweets, clothes etc) and seeing their faces when they received them! The safari was the most amazing weekend of my life!! Got picked up on time right outside the volunteer house, our Safari guide Paul was excellent. Great accommodation and food. I recommend it to everyone! You can't go to Kenya and not see Masai Mara and Nakuru!! Joe was always around the volunteer house to answer any queries or worries. He was able to take me around. Much appreciated! I would definitely recommend this programme to others. I was so nervous before going, especially being young at age 17 and being a female travelling alone. But I had the best 5 weeks of my life! I've only been home a week and already miss it loads!! It's an amazing experience that you won't anywhere else!! Kenya is a lovely country and everyone is very friendly!! It's also great value for money! The very informative booklet inside my accommodation was packed with stuff to do during time off …this was a great volunteering experience! Thank you!!! 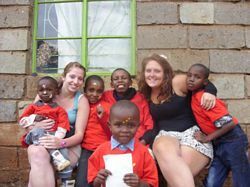 My volunteer experience in Kenya provided me with the best month of my life. Joe was great, replied speedily to all my questions no matter how silly they were or how often I sent them. The information given was exactly accurate plus described well the agenda. At the airport, I was met by Joe on time and went straight to the house. I absolutely loved my placement at the Village Orphanage. The children were so energetic and friendly. I loved teaching the kids some dance routines from some English chart music, they laughed so much. I fell in love with them all. I felt so sad to leave. The orphanage staffs were lovely and welcoming also. I had a great home stay. It was like staying at home. Mercy was so friendly and helpful, the meals were delicious and I loved playing with Esther too. Other volunteers were fun and friendly too. Joe was always helpful and obliging, saw him frequently so never felt lost in need of anything. I could get most of information which I wanted to know through contact with Joe many times by e-mail. Upon arrival, someone from Advance Africa was waiting for me with my name on a cardboard at the exit and picked me up so smoothly. This relieved my concern about arrival in Kenya for the first time. It was exactly what other volunteers have mentioned in their testimonials. Joe had arranged it my placement quickly even though my request of placement to do acupuncture and massage at a hospice was a bit complicated and made on short notice. Staying with Kinoti’s family was a very precious experience; a typical Kenyan rural life taking bath in basins, washing clothes by hands, cooking with firewood, eating vegetables, fruits and crops from own garden and drinking boiled milk from own cows. Regarding meals, all kind of Kenyan meals were provided by Mrs. Kinoti and I liked all very much. Furthermore, a variety of nutritious meals were offered. Regarding my placement, I was considered as a member of the team in the hospice by all the staff - being taken for home visits from time to time, being given opportunities to offer patients my work (acupuncture and massage therapies), assisting cooking lunch in day care services. Every day was a different experience for me. Working in the hospice, interacting with very ill patients and their families, sharing and knowing difficulties of hospice work with members was a memorable experience. I was also given an opportunity to participate in a training course in palliative care for professional health providers in one of the hospices I worked at. I gave them a presentation about a subject relating to my work and I did it using PowerPoint slide in front of other medical professionals which I had not done before. Volunteering in Kenya has been a great experience I will never forget. Before leaving for Africa Joe answered all questions in a very timely manner. I felt slightly un- prepared for what to expect when I arrived but I think it was mostly due to my last minute decision to come. The airport pick up was excellent!! We arrived late as our flight was delayed but Joe was still there waiting to great us!! We didn’t have to wait at all. The placement was fantastic. As a dental hygienist from Canada I had the opportunity to take part in/see things I wouldn’t normally get to experience at home. Mt.Meru hospital is extremely busy at all times it is fast paced environment but all the dentists that were there are ecstatic to have the extra help! I wish I had had a better idea of what to bring supply wise. I brought gloves, masks, gauze, toothbrushes, and toothpaste. Toothbrushes and toothpaste was exactly what they needed. I also would recommend to future volunteers to bring floss, interdentally aides etc as they are nowhere in Arusha. Our home stay family was amazing!! Living with a true African family forced me to learn the language, culture etc that I most likely wouldn’t have done otherwise. Food is another experience all together I’m a very picky eater and I was pregnant when I arrived so I battled nausea, stomach problems and the wet foreign food was a challenge. However there were plenty of westernized cafes in Arusha that helped me through my cravings and sick days. The highlights of my placement were the very diverse things I got to see at Mt.Meru. I as a dental hygienist in Canada don’t have the opportunity to see jaws being wired shut or flap surgeries being done and I had the opportunity to assist here! I also got to extra teeth and teach the dentists how to properly clean teeth or sharpen instruments overall just being able to help those who needed help was my highlights! Living with a family such as the one we lived with was amazing and unique. We also got a brief few minutes to go to an orphanage, which was unique in the sense that you timely get to see firsthand the poverty and seventy of some unfortunate situations. Safari experience was amazing. I got to see as many animals I wouldn’t see normally. It’s worth to get a 3-4 days experience!! I would also recommend to other volunteers going to the Serengeti or climbing Mt.Kilimanjaro as I heard amazing things about both and regret not doing it! I would definitely recommend this to other students or non students. It’s a great experience however you have to have an open mind and a” go with the flow” mentality. Joe was amazing. He was helpful and reliable. Was very good! Joe emailed me very promptly. When I asked questions, he was very good at answering all questions and helping us get ready for departure. Joe was great for picking us up even though our flight was delayed! The placement was wonderful. 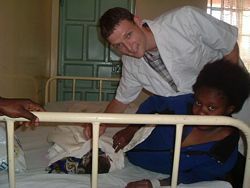 All of the doctors and midwives were so kind and taught me so much about healthcare in TANZANIA. They were very interested in learning about CANADIAN healthcare and we learned about each other. Mt. Meru was very busy and I completed 25 deliveries and observed many more. Definitely seeing breech vaginal delivery and twins’ delivery was unique as was seeing many obstetrical complications. It was such an amazing experience. I would say the host family was one of the best experiences I’ve ever had. They opened their house and their hearts to us and we benefited immensely from their generosity. It was a sad day when we left and I will definitely be returning back within a couple of years to see how our family has grown. Pre Departure: Joe always got back to our team very very quickly and answered all our questions that were great and really comforting. Arrival/Airport Pickup: Joe was there even though our flight was late and that was very good. Abraham was a great driver and stopped for us to get water. Placement: I really enjoyed working 2 projects, they were both very different but all of the staff members were very welcoming and allowed us to work with the children in the best way possible. Home stay/host family & meals: The group got to stay together under one roof so we felt really comfortable. The host family was wonderful. The pastor and family were very friendly and welcoming. Highlights of your placement: Getting to know the children and teaching my own class at Rose Academy was really interesting and rewarding. The kids at Msamaria were always full of joy and Francis was fun to be around. Any unique experiences? : Learning a bit of Kiswahili, waking up and seeing mount Kilimanjaro, waking up to roaster crowing, walking the streets by ourselves, and getting to know the wonderful town of Moshi. We saw a lot of animals and the trip was great. Would you recommend this program to others? Yes, I will let others know about these programs and recommend they come to Moshi. It is beautiful here and the people are wonderfull. Thank you so much for everything. I will cherish this experience always and I hope to return someday soon to work with the organization again. Joe did such a great job, communicating with us via email and gave us the encouragement we needed to take this step with our family. Thanks so much. It was great to have Raphael at the airport to meet us. Tumaini Children’s Home, the school, Pastor David in Narok - all were excellent. Thank you for being so flexible with us and providing such a fantastic experience for our family. We will remember it for the rest of lives! Mercy does a good job cooking for us and taking great care of the house. We felt very fortunate to be well taken care of. Keep up the great work. Tumaini and Pastor David were both fabulous experiences. We look forward to keeping in touch with both of them. Pre Departure: All emails were responded to in a timely fashion and questions were answered appropriately and promptly. Arrival/Airport pickup: I was picked up in Ethiopia on time and felt very safe and secure. My arrival in Kenya was also very well organized by Joe. Placement: Nazret is an incredibly beautiful city and volunteering in the hospital was quite rewarding. Our work in the OR was done with the bare minimum of supplies and at times frustrating. I would advise against non-medical personal to work here due to the high prevalence of HIV/AIDS, malaria, TB, and unhygienic conditions. I will be happy to give more details if needed. Home stay/host family & meals: I stayed with a lovely host family and was treated to excellent food daily. My home-stay was in a very friendly neighborhood in which I always felt safe. Highlights of your placement: The culture, history, food, and people of Ethiopia make it a place I will never forget. I highly recommend this country for anyone thinking of volunteering in Africa. Any unique experience? Trying “Tresiga” or raw beef is definitely an experience I will not forget and being hand fed is a custom I really enjoyed. Coordinator: Joe was very professional, organized, and exactly what a coordinator should be. I never felt stranded or lost and was always kept up to date of our plans. Would you recommend this program to future volunteers? I highly recommend this volunteer program for anyone interested in being exposed to healthcare at its most basic, fundamental level. Again, I advise volunteers to have experience working in a fast-paced hospital setting and know the basics in protecting themselves from pathogens. The Safari was very well organized and the staff were knowledgeable in regards to the route and animals. I will be happy to give more in depth information if anyone is interested in going to Africa. I have volunteered with other organizations in the past and all have pros and cons but I came back feeling like I was able to accomplish a lot in such a short amount of time. We were emailed the packet that contained pre departure information. Joe was on time and had a sign - that was great! The house is great and was above expectation. Mercy and Esther are a very sweet - great family. We got to work one on one with patients who were all great and I would have loved to continue working with them. Going to the giraffe center and feeding one with my mouth was pretty neat! Eating pineapples, coke and sweet bread for 35ksh every day for lunch is something I will miss. The safari was a great experience, seeing all the animals so close was really amazing. Simon knew a lot about where to go and how to spot the animals which helped . Joe was very prompt with emails and I was comfortable with the planned trip. All went well, John's boys picked me up to his home where food was already prepared for me. I enjoyed meeting other volunteers. Having another volunteer to travel with in a new environment was awesome and I would highly recommend this to anyone traveling alone for the first time. Safari with Nathaniel and four other girls was awesome. Awesome, tour guide, Nathaniel was GREAT. We all had a blast! Joe answered all questions quickly and he is easy to work with. Very good information. All emails were answered quickly and the references were very specific too. Joe was there to pick us with a sign. He took us to exchange money and to buy groceries. We were at the National Spinal Injury Hospital. They have a staff of physiotherapists who attend a total of 30 patients when the hospital is full. They were very helpful showing us around and we ended up having our own load of patients. The house is really nice and always clean. Mercy cooks very good meals and always on time! The staff is very nice and helpful, always trying to make sure everything is alright. The house is also very safe. The patients were very excited about us being there. They were eager to work and get better. The physiotherapy asked for suggestions and gave us liberty to treat the patients our way. It was sad that we could not stay for longer. The matatu rides and the open masai market were definitely unique. You need a lot of energy for those. The visit to the giraffe centre was also very special. I would definitely recommend this program to future volunteers. I would probably come back myself if time and finances allow me to do so. Thanks for everything! I really enjoyed my time in Kenya. Asante Sana!!! You should encourage volunteers to go to carnivore restaurant and to the giraffe centre. The safari was really nice too! Very informative packet also the previous volunteers emails were very reassuring. Good easy to spot with the sign. Also allowing us to get money and water. Perfect for physiotherapy. I felt we really helped the patients. The future volunteers need to be aware that they will be doing a lot of work. Wonderful. Mercy is a great cook and Esther is lovely and entertaining. I felt very safe in the house and outside playing with Esther. The patients were very appreciative and happy that we were there to help. There was plenty of work for four of us to have our own case load patients. Nakuru National Park! I almost got stepped on by a giraffe while trying to get my picture with it. The giraffe centre was also very interesting and when you tell them you are a student even from the USA, you get a student rate! Joe was very helpful with showing us around and making sure we got where we needed to be. Absolutely! I had a wonderful trip and would like to have stayed longer. Hope to come back for a longer time. Thanks for such a great experience. Everyone - Mercy, Kevin, Carolyne, Joe and Alan were all very helpful. We got to take a lot of really good pictures and see a lot of cool animals. Joe always responded within 24 hours to any emails. The information provided prior to departure was helpful and appropriate. I found the HIV counseling challenging and gained an insight in to the lives of people in the slum. Here I was much more able to utilize my physiotherapy skills. It was disheartening to see that patients were poorly cared for and were unlikely to reach their full potential. I very much enjoyed getting to know Mercy and Esther. The home stay was much more luxurious than I expected. The meals were ample and very tasty. Alan did a great job of solving out any problem around the home. The patients - My abiding memories will be of the patients. Those at Wema clinic to whom we had to break the news that they had tested positive for HIV and those at spinal injury hospital who were full of such warmth, humour despite facing a difficult battle to regain their independence following paralysis. Joe was helpful and approachable through out. He tried to ensure that every volunteer had the experience they wanted. Kevin provided a helpful orientation which included teaching us on the matatus to the key places which we would need to go. I was very nervous because I had never traveled alone before and have not done much traveling outside of the US. Joe was so helpful and made me feel as comfortable as I could. He had me call the volunteer house at night so that I could speak to volunteers who were already there and he gave me emails of others who had recently returned from volunteering. This helped so much. Excellent. I was placed at Kanjeru primary & Secondary school which is a half hour walk from the house. I chose to walk because the scenery is beautiful and the local people are very friendly (most of them are parents of the students at kanjeru. Kanjeru is a school that needs a lot of help but has amazing students and teachers who only want the best for each other. Mari and I were the first volunteers and first white people for some of them to see. They are looking forward to having more volunteers. Amazing. It really felt like I was at home and that I was part of the family. Mercy really takes care of us and you can tell that she really cares. When I was on safari for four days I actually felt homesick and missed Mercy, Ester and Alan. Safety was a big issue for me and I always felt very safe here. The meals were great. Mercy is a very good cook and everything tastes very fresh. It is also great to eat local food. The people I met in my placement and the interactions I had with them was the best part for me. They were so interested in learning about America and I loved learning about how they do things here. Through there interaction, I think we all changed the way we look at the world. They have changed my life more than they will ever know. My favorite part of this program was meeting other volunteers. It is amazing to spend time and get to know people who are interested in the exact same things like you. Mari and I were together for a week before more volunteers came and it was during this time that she became one of my best friends. We plan to stay in touch after this experience. Yes - very much. This experience has changed me as a person FOREVER. It is a little tough at first because everything is new and the culture shock... But once I got used to it, I felt I could do anything. The project itself makes you very appreciative of what you have. It is a very humbling experience. Talking to Kelley and Aida before I came helped prepare me so much. If anyone would like to contact me, I would be more than happy to serve as a reference. I also think if a person is debating whether to go alone or with a friend then go alone. The experience is more meaningful and powerful because you are forced to leave your old life behind and are free to be open minded and soak up everything around you. I was happy I could talk to a previous volunteer and asked about her experience. After talking to her I trusted this program 100%. Very good! Mercy you are doing a great work with your home! Everything is very clean! And I like it! Plus the fact that we have a good shower and water closet! I think it is very important for the volunteers to live in the clean environment. Very good, my favourite is potatoes, carrots and beans. think that Mercy, Esther and Alan are very friendly and helpful people. I will miss you! And after coming home from Mombasa & safari I felt very happy, felt like coming home. 1. Seeing Saturn from the sky. 2. Safari and boating at Lake Naivasha. 3. Visiting Mary Leaky Girls School. 4. Working with Kanjeru kids and seeing them improving in discipline. 5. Watching TV with Mercy, Esther and Alan in the evening. 6. Meeting new volunteers and becoming friends with them - Jenny- US, Jenny - UK, and Mandeep - Canada. 7. Going to Mombasa and seeing the Indian ocean. 8. Standing just 2 meters away from a giraffe. Joe , I think you are doing a very good job. You are on time and help volunteers a lot. Yes! I will go home and tell my friends. There are a few friends who might possibly be interested in coming to Africa. I really liked my experience a lot and I am so happy that I came. It has been GREAT! Every question we asked was answered fast. Lots of information was given to prepare ourselves. Even though I missed my flight, Joe managed to come and get me the following day. He made sure that everything was fine. St. Elizabeth hospital was great. Mount Meru hospital was excellent for the midwifery electives and matched our goals. 4 births in 4 hours at Mount Meru hospital! I saw obstetrical emergencies that I may never see in Canada. Would you recommend this program to future volunteers? Yes. I will inform future midwifery students. Couldn't ask for a better coordinator! Went out of his way for us. He is well organised and punctual. Before departing, I was provided with sound advice and myself and Joe corresponded regularly making sure I was prepared for the programme. I was met by Joe at the airport. It was nice to have somebody to pick me up and provide me with an orientation and briefing of the series of events. I did a varied programmes. Spending a day at an orphanage was a highly rewarding and exhausting! The kids were full of such life and energy. After this I went on safari, my incredible experience which was of good quality and well organised. I then headed South to Oloitoktok. A lovely town on the foothills of Kilimanjaro. Here I spent time getting to know the town, helped construct a house and spent a day at an HIV/Aids counselling centre. The best experience soon followed, staying with a Masai family. I became a "Mzungu Masai" for some days! My hosts have all been wonderful. They provided me with good quality food and were helpful when it came to information about local transport etc. The host in Oloitoktok was superb! He provided me with amazing local food and an opportunity to be part of the local community, giving me real insight to real Kenyan culture rather than the manufactured version often received by tourists. The highlight of my placement had to be staying with a Masai family. I helped construct a Manyatta using cow dung and mud! I herded the cattle to the river and witnessed a Masai ceremony. 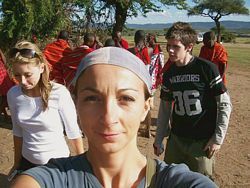 I was even dressed in the Masai clothing! I felt part of the family and it gave me an opportunity to enjoy the delights of a culture so different from my own. The most unique experience had to herding cattle to the river and the looks I received from passing Masai were priceless. They could not believe their eyes! Joe was great in organizing the placement and answered all my questions. Email replies were prompt and helpful. No problems at all. After picking up my bag I was met outside by Mehretu my host who was holding a sign with my name on it. The welcome was very friendly and I felt like I was in safe hands. 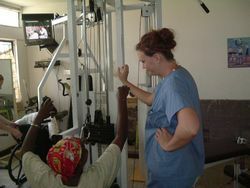 We volunteered at a Physiotherapy Clinic in Addis and it was a great, eye opening experience. Physio is still something relatively new in Ethiopia and the patients really appreciated our help and the fact that we had traveled all the way to come and help them. The staff at the centre were fantastic; flexible, friendly and eager to support us and introduce us to other physiotherapy centres and physiotherapists. The family was absolutely lovely. We stayed with a couple who had a young daughter. They took special care of us, ensuring we were safe and things ran smoothly. It was a great experience staying with a family as they introduced us to cultural traditions, cultural dishes and Ethiopian coffee (yum)! They became a special part of our stay there, going above and beyond their requirements. Mehretu, our host for the four weeks, was great. He’d make sure we arrived where ever we were headed and would accompany us home if needed. He was very reliable and helpful and made our stay in Addis simple and enjoyable. Sure. Traveling to a different country is always a great experience and to be part of a team traveling with a purpose to help others is not only rewarding for the recipient but also for you. The safari in Kenya was great too. Our safari driver, Simon, was very knowledgeable and eager to show us as much as possible over the four days. It was great to meet some of the other volunteers whilst in Nairobi as well. We were very well informed about our host family, physiotherapy clinic and costs of living through email contact. We also had a good idea of what was needed to bring with us. Contact details were provided early on in the correspondence which made it much easier to plan the trip. Mehretu was really punctual, in fact, he was waiting for me as the plane was delayed. He was very accommodating and well-organised with a car already waiting. I spent 4 weeks at a Physiotherapy Clinic, a private clinic in Megananga. It was 30 minutes from our host families' house, which gave us the opportunity to catch public transport in Addis. The ride in the public taxis cost 2 birr per person, one way. We learned so much at the clinic because the physiotherapist, Altaseb, allowed us freedom to do what we wanted with the patients, and we were able to teach him a few new things as well. We stayed with a family who lived in a new developing area in Summit, near CMC. It was so lovely, the family were very accommodating and the home-cooked food was incredibly good. We had so much traditional food, one of the many benefits of staying with a family versus a hotel. The people were amazingly nice and really interested in learning about Australian culture. Our host took us around Addis and one weekend to Langano/Awassa,which was a lot of fun and very interesting. Ethiopian dancing was as much fun to watch as to try and do! Learning Amharic was also lots of fun! Joe Ngugi and Mehretu Mulu Would you recommend this program to future volunteers? Of course, it is a rewarding experience! Thanks so much Joe for organising everything, including the safari in Kenya! Visa queue at the airport was long but the pick-up was good and on time. Nairobi language primary school. Worked there for four weeks and was very happy with my placement. The homestay was very good. Nice clean bed sheets is a must for me so I was happy with that. Also the room sizes are very good with good storage. The host family and the meals were good. The main highlights of my placement was the fact that I was in the heart of Kawangware slums. It was an adventure every day just to walk into school! Meeting all the kids and bonding with them through football. I taught and played football with them and I took them for P.E. I felt very welcome from David the headmaster, and Humphrey a teacher there. Teaching for the first time was amazing also! Most of the things I experienced were unique like cramming into matatu, the crazy driving all over Kenya, seeing how people live in such poor conditions and just get on with life, the slums and the warmth of the people. The roads which look like the moon and not roads for car to drive on! Was very good, was there when I needed to know things and took me to where I was placed, helpful and friendly! With the experience I had here yes I would recommend this program. Just like to say thanks for the experience here in Kenya and hope to come back sometime soon! Joe answered all my emails fast and it helped me a lot! The host was really nice and a really good cook. Food was good. Learned a lot! Children there were really wonderful and they will forever be in my heart. Decided to move to Kenya! Yes. Thank you for helping me come to Kenya. Kenya is a country with a bright future because of its wonderful people! Life here is not easy but it is very rewarding. I enjoyed working with children and also meeting friends from all over Kenya. Cannot wait until I return! Joe answered all e-mails and gave all necessary information. Training place was really nice and I enjoyed my placement amongst the Masai. My host was good, and took care of me very well. Trip and games with children. Visiting the Manyatta was a really great experience. Learnt history of the Masai from the Children. Waking up in the morning next to goats and chicken was something special! Trip to Oloitoktok with my host and children and a moment when children came to hug me and told me about their life experiences. Yes. It was a very good and eye-opening experience for me. Like most visitors travelling to Africa for the first time, I had many questions. Joe answered each one thoroughly and quickly. Joe was waiting for me at the baggage claim with a name on a sign. I began in Arusha, Tanzania which I loved. I wasn’t teaching maths thus, I decided to transfer to Nairobi. Joe was happy to accommodate the change and I found a great primary school in Kawangware slum of Nairobi. The facilities were poor but what the students lack in environment, they made up for with a strong desire for learning. I am a basketball coach in the States and I was able to organize basketball clinics in both Arusha and Nairobi which was great! I have built very strong, meaningful relationships in only 4 weeks and I am already planning my trip next summer. Hopefully, I will bring down some of my students and players from Florida. I enjoyed my home stays very much! I always felt safe and at home. The safari was great and is a must if travelling to Kenya or Tanzania. Joe is a hard-working coordinator and does his best to accommodate each volunteer’s unique vision. 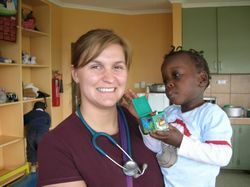 Anna (Kent, UK) Medical Student, University of Nottingham - Medical Volunteer in Blantyre, Malawi. Malawi is a beautiful country. Duncan was there on arrival to pick me up and was very friendly and welcoming. 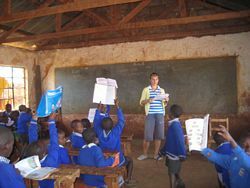 I have been kept very busy teaching in the local school, visiting the health care centre/clinic and visiting the orphans. In the clinic, I have been able to help with taking down patient’s medical histories, dispensing drugs and giving injections which has been very valuable work experience. The experience that I have got from the clinic has been fantastic and will no doubt help in my medical career. I have also been able to teach the girls at the secondary school some netball. Overall, the placement has surpassed my expectations. Duncan and his family have been very welcoming, giving me my own room to sleep in, hot showers, and meals every day. There is always plenty of food provided. Duncan has also helped me to sort out working at the school and the health centre. The children in Malawi are adorable and everyone wants to meet you and shake your hand. Being able to help out (I bought some food for the orphans) has been very rewarding. It has been very wonderful working with the children at school and seeing how passionate they were about their education. I recommend visiting Malawi to everyone. There is something for everyone to get involved in whether it be teaching, sport, medical work experience, or religion. The people here are the kindest I have ever met anywhere in the world. We were absolutely thrilled with our respective placements at Wema Hospital and Kawangware School. The fact that our volunteer projects were within 10 minutes walking distance from each other as requested was great! Our contacts were extremely helpful and friendly. 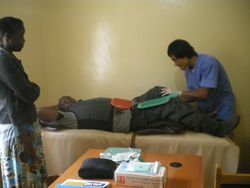 Wema Hospital gave exposure to a wide variety of illnesses and patients as well as hands on care and treatment. The placement was all that we could have hoped for. An experience we will never forget. The host family was great, very kind and friendly. The location was very convenient and near vital amenities - email, shopping, placement. Food, water and accommodation were very satisfactory. The accommodation for volunteer safari was great. The animals were fantastic and the food amazing - next time, we are flying into Masai Mara! The coordinator was very prompt in email response, willing to accommodate our needs, easy to talk to, very welcoming, and knowledgeable and always willing to answer questions. Overall, this experience has been extremely rewarding. We loved the people we met, our host family was terrific. We would love to come again - we have enjoyed every minute. The accommodation was excellent, diners were outstanding. We have fallen in love with the local food, the culture and the people. Thanks for teaching us how to cook. We especially appreciate helping us find a church to attend here. We would absolutely recommend this program to potential volunteers. It is inexpensive and extremely rewarding. Accommodations were all we could have asked for. We appreciate the experience...thanks so much! Emails and all questions were answered promptly. My placement was wonderful! All of the staff were appreciative and I was able to practice my nursing skills. The clinic was really an eye opener. I truly enjoyed the Kenyan people as well as the beautiful landscape. The trip to Kibera was very interesting. I enjoyed meeting and talking with different people. Each person gave me a different perspective of life. The volunteer safari was amazing. This was probably one of the most amazing experiences of my life. I highly recommend this trip to anyone. Thank you for this experience. It has been life changing even though I was only able to stay 3 weeks. I plan to come back and bring my sister soon. Pre-departure enquiries were usually replied to on the same day and anything I was unsure about Joe helped me understand them! I enjoyed experiencing a totally different culture, meeting the children and meeting other volunteers. It was frustrating that we couldn’t do more to help the children but we did that which was within our capabilities. A typical day would be to wake up by 9am, have breakfast with host family and meet other volunteers. At 10am - arrive at orphanage and say hello to all the children. 10.30 - 1pm working with the youngest children / babies, playing with them, feeding them, entertaining them, supervising. 1 - 2pm lunch. 2pm - 5pm teaching different classes with in between looking after the youngest again. 5pm - home to host family for dinner. Evenings free! Other activities include supervising lessons, lesson planning and preparations. My host was lovely, made me feel really at home. She was very supportive and looked after me as if she were my mom! The food was nice and she always looked for our opinion, was good because we could sample the local food. The accommodation was better then expected, in a newly built apartment! near an entertainment place! Pre-departure was brilliant considering how late we applied. It would be good to put pictures of the school and host family to see where we will be staying. Brilliant! Pastor Duncan picked us up on time and made us feel comfortable and safe. Placement has been excellent. We have had a lot of opportunities to teach. We have been teaching in a nursery, primary and secondary school! All the children are eager to learn which is a blessing to teach. We have been staying with a lovely family. Pastor Duncan, his wife and their three little boys. The house is big and spacious and our room is comfortable and very clean. There is always a warm meal on the table at breakfast, lunch and dinner and always hot water ready to bathe. Our host family are always friendly and make us feel at home and safe. Very good communication, always checks to see if we are happy and safe. Very supportive and informative - provided very good information about what to bring etc. It would have been nice to have more project information e.g. exact location, photo of host, accommodation details etc. Excellent opportunities to volunteer in a nursery, primary and secondary schools. We have been doing all three! We have been very well taken care of and given brilliant opportunities to teach English or any other subject we like. This placement is suitable for people on their own or up to four would be fine. Girls alone are very safe here too. We are staying with Pastor Duncan, his wife Maggie and his three little boys in a lovely big clean house. There is a shower, toilet and a big bedroom with electricity! There is also internet connection here! They have been extremely friendly and welcoming, making us feel at home straight away. Very supportive, many phone calls to see if we are happy. 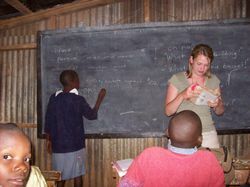 Laurence and Marilyn (Cottens, Fribourg - Switzerland) - Volunteering in various Kenyan Schools and Children's homes. Joe is a friendly person. He gave all the information that must have to prepare our volunteer journey in Kenya. We left Switzerland very ready to enjoy and discover the culture of Kenya. We arrived very late because it was raining in Amsterdam. When we arrived at Jomo Kenyatta Airport, Nick and Joe waited us. They are very friendly! The people and the children are very friendly. The activities are various. We are just shocking that the teachers slap the children if they don’t give the right answer. In our country, it doesn’t exist. The children are a treasure of the life of the tutor at our country. We protect the children! It is very correct. We have all that we want to pass a good journey in Kenya. Our hosts are very friendly. We like to discuss with them to discover the culture of Kenya. The Kenya food is very good we like it. Our host is a very good cooker. We like to play with her children all the evening. We are enjoy to be in Kenya. Joe is very friendly and a conscientious person. If we have a problem, we call him and he help us direct. It is a person of trust. *** Sorry, for the falses but English isn’t our mother tongue! I applied to Advance Africa quite late and within 2 weeks to my departure. Joe was great and quick on the email. I arrived in Dar, spent the night there and took the bus to Arusha in the morning. Was fine. My host family is very lovely and speak great English which has been very helpful. The meals have been really nice. John was great. He helped me a lot. He was fantastic! Good. Collected from the airport by Nick and Simon. 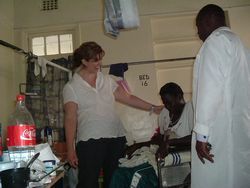 Placement: Worked at Melchizedek Hospital in the wards with 2 other Advance Africa volunteers. Nurses very friendly and helpful. Home Stay: Great host and very good meals! Would you recommend this program to future volunteers? : Yes. I am very happy with my host family and really enjoyed staying with Mercy and Easter. Over the months, they more to me like my family than a host. I would want to come back again and I wouldn’t want to stay anywhere else! I will miss them so much when I go! Mercy was very good to me and was always working hard cleaning and preparing the meals. Arrival: Was collected from the airport by Joe. Placement: It was an "eye-opening" experience to see how they live as it is very different from my regular life. I am concerned at the lack of resources that this orphanage receives. They need access to water! I think that they could also benefit from some donations of vitamins for the children. (they don't have access to fresh fruit - too expensive). There were a lot of sick children while I was there. Home Stay: I really enjoyed the company of my hosts. We had some very fulfilling conversations in the evenings over dinner and they helped me to understand why they are as committed to the orphanage as they are. We ate traditional food (githeri, ugali, uji and other dishes). The accommodation was simple but satisfactory. I had my own room (which locked) and access to a flush toilet! Would you recommend this program to future volunteers? : This was a very rewarding experience for me. I would definitely volunteer again, and will recommend this experience to others. Pre Departure: I got all my questions answered in detail and promptly. Arrival: On arrival, I found the volunteer coordinator waiting for me. That was great because it was my first time in Africa. Several other volunteers were doing their placement at the same hospital. I really enjoyed it especially because it had quite a number of specialities. I was able to go round various wards with a team of doctors and was really involved. It's been a real eye-opener. My home stay has been wonderful. I shared a spacious room with 2 other volunteers girls from USA and Australia. It was good because we kept each other company and talked late into the night! My host family have been super friendly and kind. They were truly excited to have us staying with them and taught us some Swahili. They have 2 children. The older one is 10 and the younger one is 4 and goes to pre-school part of the day. The coordinator was available for questions at all time. He was very professional, reliable and friendly. He gave us the much needed support and consistently went way beyond the call of duty during my volunteer period. Would you recommend this program to future volunteers? Yes. I plan to be back soon myself! Pre Departure: Joe was very helpful and answered all of my questions immediately. Arrival: I felt prepared for the trip. Joe helped me get around Nairobi and even took me back to the airport to get my late baggage. Placement: I loved working at Brightstar Academy as well as tutoring the children at the orphanage. I was happy to be volunteering at a nearby school, because combined with duties at the orphanage I kept busy. 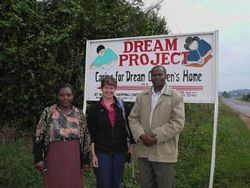 I think the Dream project is good for someone who is going to be in Kenya for a short time. If at Dream Project, I would do exactly what Joe did for me and volunteer at a school as well. Dream Project is a small orphanage (36 Children) and does not need more than 1-2 volunteers at one time. Can you describe a typical day? Woke up around 7am and had tea and bread. Walked to Brightstar Academy and taught English lessons and helped with the children until 1pm. Walked back to the orphanage and ate lunch around 1:30-2:00. Helped with clothes washing, tutoring, making dinner, washing dishes, or gathering vegetables from the field. Sometimes we would walk to town to get things at the market. We would eat dinner around 7pm and sing, tutor the children, or just talk until bedtime, which was around 9:30. The children go to bed around 11pm and wake up at 4:30 for chores. They are loud, so bring earplugs if you want any sleep. Home Stay: The hosts were nice, however, I did not see them much. They both worked and did not return until 7pm-9pm at night. I felt they were supportive of the volunteers. They are very religious. The food was good (mostly bread, cooked cabbage and sometimes meat). I had my own room with a lock on the door, so it was nice and private. I did get pretty cold at night, so if you go in the winter, be sure to pack a warm sleeping bag and clothes. Co-ordinator: Joe was outstanding and very supportive during my stay in Kenya. I felt like he listened to what I wanted and made sure I had another assignment at Brightstar to keep me busy. Would you recommend this program to future volunteers? Overall the experience was satisfying and I would do it again in the future.